3D Topicscape is an information organizer designed for people who like mapping. I switched from Brain to this while it was still in Beta, because I was able to see much more of my information at one time. Since then, it has been one of my basic productivity tools, that’s open on my desktop the whole time. This is flagged as a “Fave” because I use it every day and couldn’t do without it. I instructed the antivirus program to remove the threat, but I am wary to run the program, since the internet reports show this threat is a serious worm. Does anybody have an experience with this issue? Hello @VK. I’ve been using Topicscape since very early days – I was one of their beta testers four or five years ago. I use the Pro version, but I doubt the Student Edition is different in this respect. It’s a well established and reputable company. Why don’t you contact them about it? Probably an over-sensitive anti-virus program. Hi Vic, I attach below a response from Topicscape. I use Comodo antivirus which seems to be an issue. We have now run a test at VirusTotal using jittmp10.dll from one of our PCs. Only one out of 43 A-V programs found an issue, Comodo, and that is “Heur” or heuristic, meaning it thinks it resembles something it has seen before, but is not identical (see attached image). But as jittmp files are generated by Java when Topicscape SE is first run, the one I tested may not be the same as yours. The contents will be affected by what you try to do first on Topicscape and the setup on your PC. Then we can test further – and if you can let us know which Anti-Virus software you use, that will help. Thanks for the update VK. I’ve used TopicScape Pro for years and I’m always finding new uses for the software. From file organization and general research to helping me tidy up my PC desktop, TopicScape has been useful to me in many ways. This product is truly unique in how data is displayed and associated. TopicScape is fun to use and helps me think of my many projects and files in new ways. It also helps me keep on top of my typically cluttered life. If you’ve tried other mapping software and would like to try something different but useful, I highly recommend it. There is a free student edition (which is what I started out with – and afterwards upgraded to pro) to help you get a feel for the product and discover how it can help you. TopicScape is a very affordable and extremely useful piece of software that I thoroughly enjoy using on a daily basis. Topicscape Pro is an outstanding tool, not just for organizing enormous amounts of information, but also for collaborating with other model based system engineers (MBSE) during complex system architecture development. Topicscape allows SEs to fly through elements of the architecture and readily visualize the complex attributes and relationships that exist among the various classes of elements. I would like to invite all Visual Managers to check Topicscape Pro out in action. It’s amazing supporter in management area. It helps with contextual information management (visual structure with important files). 3D view gives us opportunity to see topics in different views. As Dave Esko wrote – it’s great to use MindManager & Topicscape as a team. 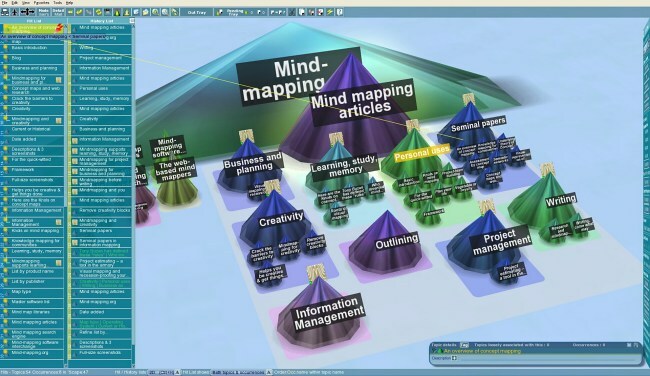 We need only a few seconds to see MindManager map as 3D structure. My advice: try trial version in Your own business area – it’s the best way to see great POWER of Topicscape. As far as I’m concerned, Topicscape Pro is not deep enough into the mainstream of what I’d consider the visual info management tools! I generally fairly complex Topicscapes, most with a couple of hundred nodes and a few with a thousand or more. I used to use two visual management tools together; Mind Manager 8 and Topicscape Pro 2. However, since Mindjet turned their backs on their customers with the Mind Manager 9 release, I’ve moved away from their products (except for the MM8 version). To me, a company has to have all three of these legs for me to use their products. Topicscape runs rings around Mindjet on all three of these areas! Mindjet lost their customer focus and their innovativeness, but retains a modicum of success with their prior releases of Mind Manager (pre MM9) as it relates to operational features that I still like. Seems that Mindjet turned their backs on their most faithful customers. Topicscape keeps on delighting their customers and their product is far superior in many ways! My advice is to take a look at Topicscape! It’s priced very fairly and has features in it too numerous to go into here. You’ll agree, that Topicscape has what you’ve been looking for in a visual mapping tool set that will be difficult for vendors in this space to beat!